This is a blog inspired by the architectural folly and other issues and themes relating to elaborate forms of fakery. I’m Lara Eggleton, an art writer and historian based in Leeds (UK), and this is where I write about encounters with objects, events and other things that might broadly be discussed under the rubric of ‘folly’. According to the Oxford English Dictionary, a folly indicates ‘a lack of good sense’, ‘a foolish act, idea or practice’, or ‘an ornamental building with no practical purpose, especially a tower or mock-Gothic ruin in a large garden or park’. 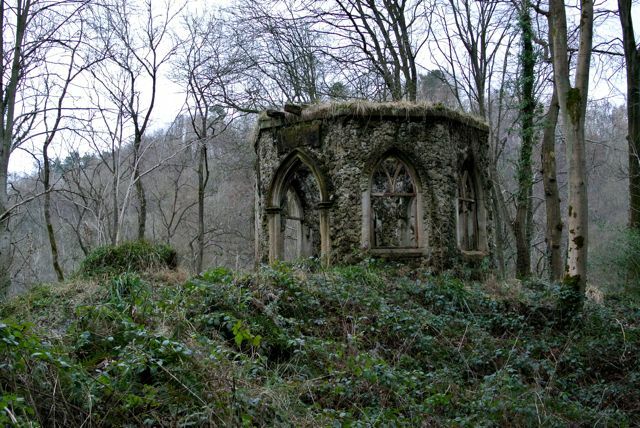 Alternatively called ‘shams’ or ‘artificial ruins’, architectural follies are often associated with insincerity – they are monuments pretending to be functional, false imitations of the real thing. In Britain, most date from the eighteenth and nineteenth centuries when folly building was the pastime of wealthy estate owners. Their ‘eccentric edifices’ are usually variations on Classical or Gothic buildings, some designed to resemble ruins or grottos while others are slightly more unusual, like ‘White Nancy’, pictured below. I’m interested in themes and questions raised by these architectural anomalies, and, more generally, the impulse to imagine, design and construct things that serve no immediate or obvious purpose. My curiosity springs partly from conceptual and theoretical concerns (i.e. why and how do we distinguish ornament from structure, superfluity from utility, artificial from natural, fake from real), and also from a more whimsical, hobbyist kind of fascination with folly building. My encounters with architectural follies and other forms of cultural fakery thus form the basis for creative reflection and social critique.